If astronomers could look back in time, one thing they'd love tosee is our solar system as it formed, 4.6 billion years ago. Now they can, in a way. By looking at sun-like stars in their infancy, researchers haveused a powerful telescope and a new bag of tricks to peer at planet-formationunder way. The result: Three wildly different setups, suggesting our solarsystem is perhaps neither uniquenor allthat strange. When a star is born, there's often a leftover cloud of gas anddust that flattens out into a thin disk. The material orbits the star in thedirection of the star's rotation, looking something like the rings of Saturn.In that disk, which in the case of our solar system would have extended out toand perhaps beyond the orbit of Neptune, knots of material form and someeventually become planets. Caltech researcher Klaus Pontoppidan and colleagues used theEuropean Southern Observatory's Very Large Telescope to explore such disksaround three young sun-like stars. "This is like going 4.6 billion years back in time to watchhow the planets of our own solar system formed," Pontoppidan said. In regions where the dust appears to have been cleared out,molecular gas is still highly abundant. 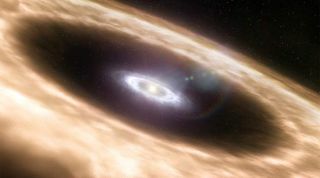 This can either mean that the dust hasclumped together to form planetary embryos, or that a planet has already formedand is in the process of clearing the gas in the disk. For one of the stars, SR 21, it's likely that a giant planetorbits at 3.5 times the distance between the Earth and the sun (3.5 astronomicalunits, or AU). For the second star, HD 135344B, a planet could be orbiting at10 to 20 AU. The observations of the third star, TW Hydrae, may also requirethe presence of one or two planets. "The disks around these three young, sun-like stars are allvery different and will most likely result in very different planetarysystems," concludes Pontoppidan. The stars are between 200 and 400 light-years away. Each diskmeasures roughly 100 AU across. The researchers did not actually see any planets. Instead theyused a technique known as spectro-astrometric imaging to give them a windowinto the inner regions of the disks where Earth-like planets may be forming.The team could measure distances as small as 0.1 AU and measure the velocity ofthe gas at the same time. Based on the size and shapes of the gaps, and themovement of the gas, they used planet-formation models to project the presenceof alien worlds.